The garden pavilion in Anne Kennedy and Peter Nadin’s New York City townhouse. 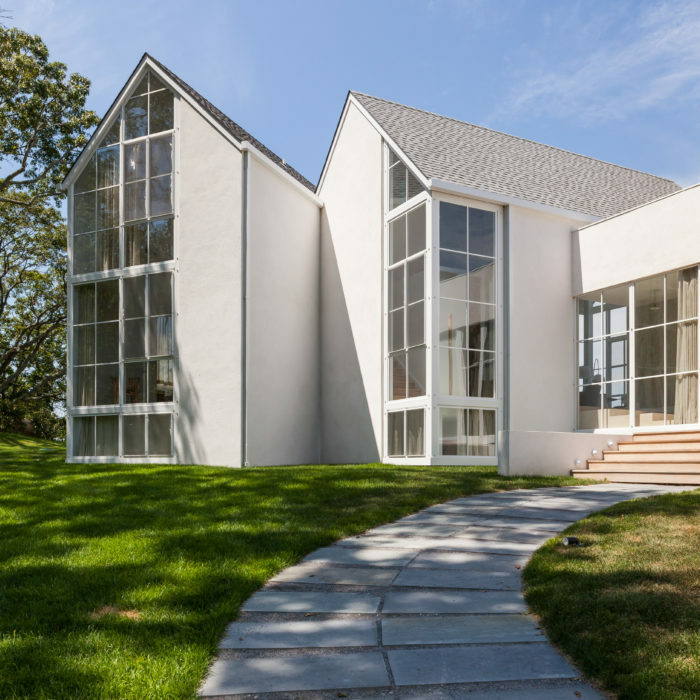 To understand why Michael Haverland has quietly become one of the most in-demand architects among the New York intelligentsia, one need only visit the library of the East Hampton home he shares with his New York Times columnist partner Philip Galanes. The space is illuminating: daylight pours through two expanses of gridded floor-to-ceiling glass and over another pair of walls lined uniformly with binders. Figurative enlightenment is proffered by the binders themselves, which contain volumes of research and represent Haverland’s intense dedication to each project. That scrupulousness has yielded covetable residential commissions inManhattan, the South Fork and most recently the Hudson Valley—not to mention a waitlist that can stretch to years. architecture school, Haverland orchestrated the time and talents of various graduate students to enfranchise New Haven residents. His efforts culminated in an elementary school addition whose wider gestures (an elliptical lobby) and exquisite details (glazed bricks layered between cinderblock) belie an impossibly tight budget. If Haverland’s Yale chapter modeled the rigor with which he approaches his work to this day, it also cemented a belief that “architects should be working on civic and public buildings—projects that benefit as many people as possible.” But the world had slightly different plans for this architect, who was simultaneously designing a duplex in Greenwich Village for himself and Galanes, followed by the East Hampton gem. The homes impressed cultural luminaries in both places for their ability to ground high modernistic ambition in history and domesticity, and soon afterward Haverland was focusing mostly on residences for clients such as fashion designer Calvin Klein and Knoll CEO Andrew Cogan. 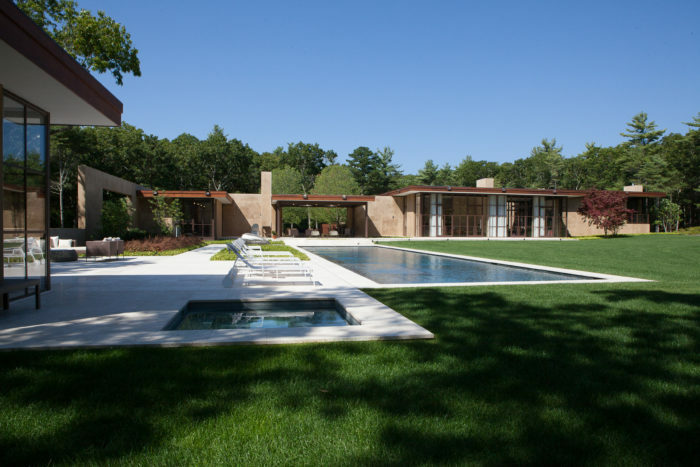 An East Hampton residence that consists of separate buildings and movement patterns. Haverland is arguably best known for his portfolio of Hamptons homes, where he has managed to reconcile agricultural vernacular with the local legacies left behind by mid-century greats Pierre Chareau and Peter Blake. Designing in this context has often yielded campus-like arrangements of buildings and walls of glass humanized by their mullions and muntins. But it would be ill-advised to think he has settled into signatures. First, there are those binders to consider. Even in well-trod territory, Haverland treats every house like a babe in the woods. “I start every project by thoroughly understanding the site,” he says, explaining that his analyses involve studies of sun exposure and of simple physical conditions, such as who picks up the trash, where you park in the summertime and what’s the zoning of the property next door. He also devotes considerable page count to precedent—in order to give a new spin on historical example. “To me there’s nothing worse than repeating something without knowing it,” Haverland says. The results range from tweaks on tradition, such as a gableshaped wall of glass on Shelter Island, to self-imposed innovations like computer-generating foam molds for a Springs home’s cast-concrete panels. Then there are the clients themselves, such as artist Peter Nadin and Art + Commerce cofounder Anne Kennedy, whose own desire to create something meaningful aligns with Haverland’s method—and propels it forward. “It’s such a dream to work with people like Anne and Peter because they have such exquisite taste, and everything they do is so deliberate and thoughtful,” the architect says. “Of all the people in this collaboration, I learn the most.” Haverland’s relationship with the couple spans more than a decade and has most recently yielded an archive building to accompany Nadin’s studio, which Haverland also designed, and the large greenhouse that Kennedy frequents at their 160-acre farm near the Catskills. The farm dates to 1784. Nadin and Kennedy began acquiring the property in 1984 and Haverland completed the art and conservatory spaces in 2011. A home in Shelter Island. Haverland’s trio forms a jagged line, which is carefully calibrated to engender a sense of security while framing specific views of the farm and surroundings hills. Their gabled roofs acknowledge the region’s traditional response to snow and Haverland further honors Hudson Valley heritage by fabricating the studio’s exposed scissor trusses from the site’s own hemlock trees and adapting the archive building’s masonry structure to local tradespeople’s skills. Yet just as the compound contains nods to convention, so it has its subtle rebuffs. Most notably, the studio features glass and mahogany doors that soar to 14 feet high—a monumental scale not seen in historic barn buildings. architect recalls: “‘What happens to the relationship between a building and the ground when you do a block foundation rather than a poured foundation? only improved the final product but integrated the buildings into Nadin’s own body of work, which scrutinizes the relationship between agriculture and art. Architects have a tendency to feel frustrated, always. When they reach mid-career, the frustration usually has something to do with influence: residential architects dream of a project that is more conceptual than most homeowners can stomach, while commercial architects crave designing a house that changes the course of its occupant’s life. Haverland bypasses the ennui by choosing to hold his home designs to standards that are both academic and emotional. And the clients are choosing him, in turn.